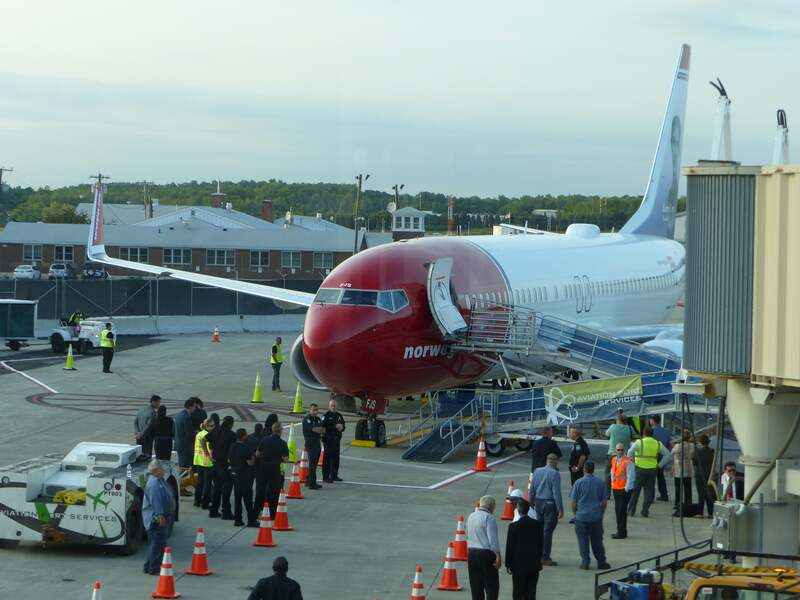 Low-cost carrier Norwegian Air recently debuted a new route at an unusual New York airport: Stewart International (SWF). The Pros: great ticket prices, smooth boarding process, friendly staff. The Cons: narrow seats, unimpressive food, the airport is 60 miles from Manhattan. When Norwegian Air announced $65 one-way fares from the East Coast to Edinburgh, Scotland, back in February, anyone hoping to get to Europe for less jumped on the chance to cross the Atlantic for such a low rate. While the price crept up a bit in the following days, we were able to book seats on the June 15 inaugural flight. Norwegian, a rapidly expanding low-cost carrier, currently offers 58 routes from the US, including 52 routes from 13 US airports to cities in Denmark, France, Ireland, Italy, Norway, Spain, Sweden and the United Kingdom, plus another six routes that fly to Martinique (FDF) and Guadeloupe (PTP) in the French Caribbean. Initially, this maiden journey was going to feature the debut of the Boeing 737 MAX 8, which was designed for longer flights and offers lower fuel consumption and more seats, all of which allows the company to charge less for tickets. Unfortunately, that plane wasn’t ready for takeoff on June 15, so I ended up taking a 737-800 from Stewart Airport (SWF) to Edinburgh (EDI), flying in economy — the 737 MAX, meantime, will debut on Norwegian later this summer. 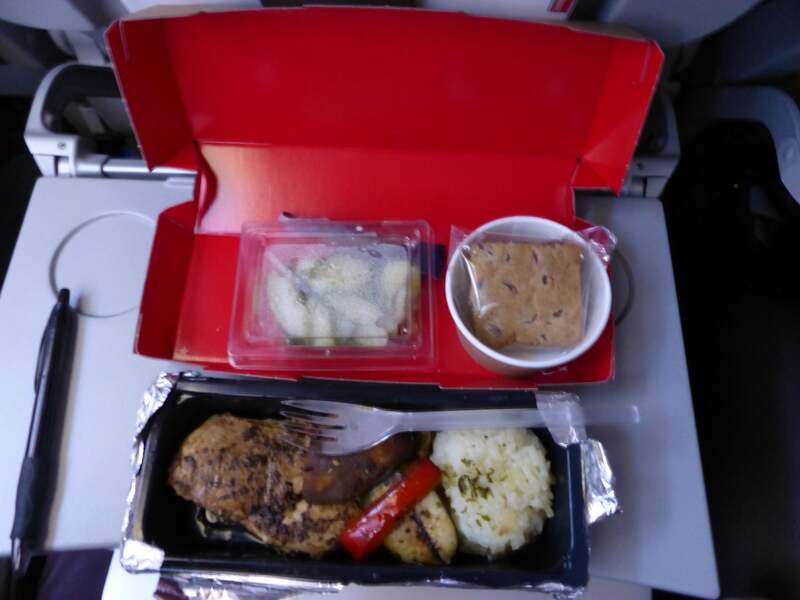 I paid $169 for a one-way ticket and opted to spend $70 extra to secure a seat, a hot “nice and tasty” meal and one checked bag — for a grand total of $239. Note that checked bags must weigh less than 44 lbs (20 kilos) and carry-ons are expected to weigh less than 22 lbs (10 kilos) — I never had to weight carry-ons immediately before a flight. The best way to book this would be with a travel credit card like The Platinum Card from American Express, which lets you earn 5x points on airfare purchased directly with the airline. You could also use another top travel card like the Chase Sapphire Reserve Card, which gives you 3x points on all travel and dining expenses worldwide or the Chase Sapphire Preferred Card, which gives you 2x points on travel purchases like airfare. Norwegian’s site also has a “low-fare calendar” that helps compare prices on different days, so you can opt for the $200-$300 range instead of $400 or $500 depending on your dates. 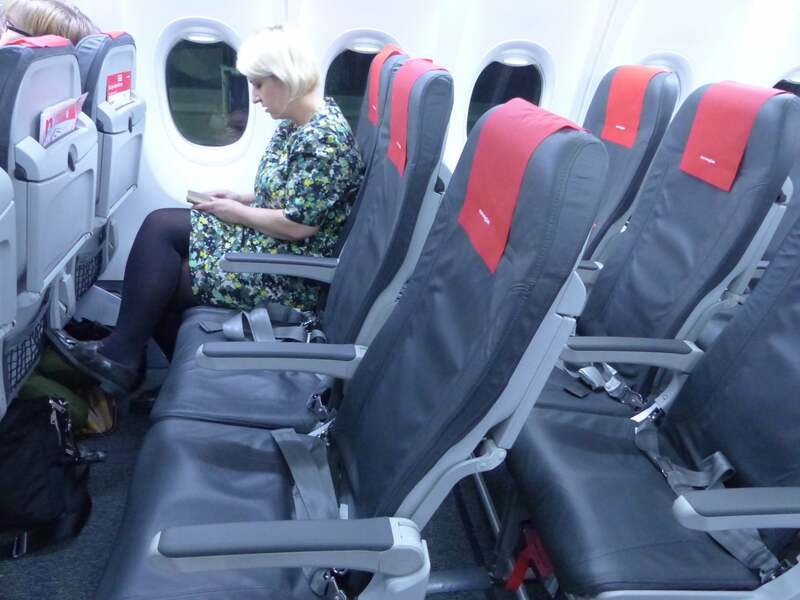 Some people — like TPG Associate Editor Emily McNutt, who tested out Norwegian last year — have successfully purchased even cheaper tickets through the foreign-language version of the airline’s website. When you imagine flights from New York, you inevitably think of JFK, LaGuardia or Newark (EWR). 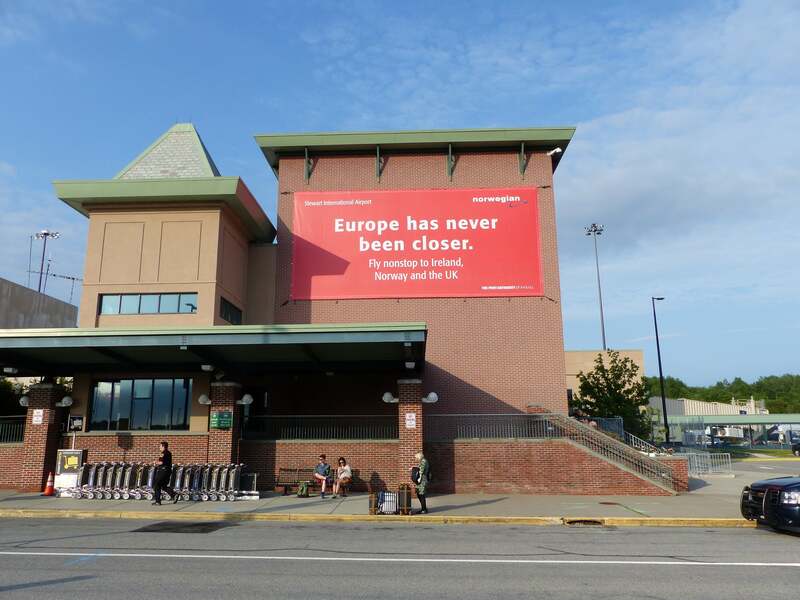 Norwegian is gambling that Stewart International Airport (SWF), located in Newburgh, can compete with the big boys by offering more flights for less. The catch? You have to schlep 60 miles upstate (for some people, though, this may be even less of a schlepp). Option #1 was not going to work because my return flight lands at JFK. To gauge option #2, I called Visconti Ground Transport, a taxi company mentioned on the airport’s site, and they told me the trip from Manhattan would cost more than $300. I tried Uber next and the app suggested the price would be $264. Anyone hoping to save money by flying on Norwegian is not likely to spend $250 or more just to get to the airport, so that option was out, too. Buses are the cheapest option and the Port Authority just launched a new bus service from Port Authority in New York City to Stewart International Airport for $20/person. But I needed to get to the airport during rush hour and didn’t want to risk getting caught in traffic, so I chose the train. 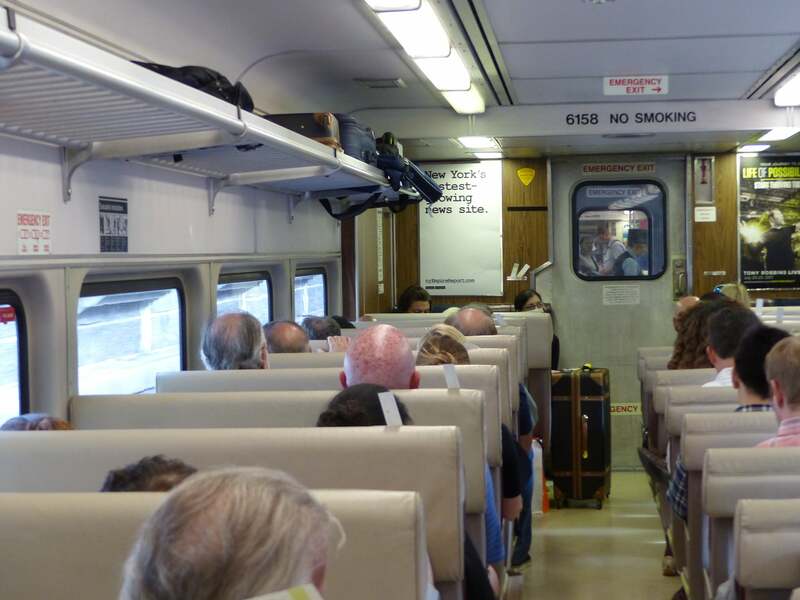 Specifically, I paid for a one-way Metro North ticket to the Beacon stop on the Hudson line to Poughkeepsie, which leaves Grand Central Station every 15 minutes or so around 5:00pm. During rush hour (ie. “peak” times) these trains load up with passengers at Grand Central quickly, so expect to walk down a long platform if you want to find two or more seats together. Keep in mind that you may have to ride backwards as half the seats face one way and the other half face the opposite way. 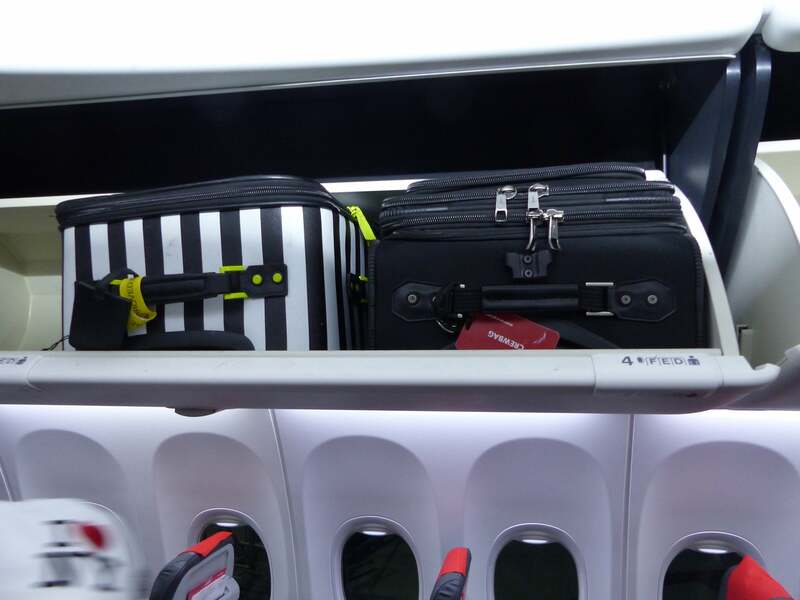 Overhead bins allow for smaller luggage but not trunks or huge suitcases — and there’s only one narrow aisle. I purchased a ticket in advance for $22 using the MTA eTix app. It took around one hour and 20 minutes just to get to Beacon. Note that the train may skip some stops — so be alert. 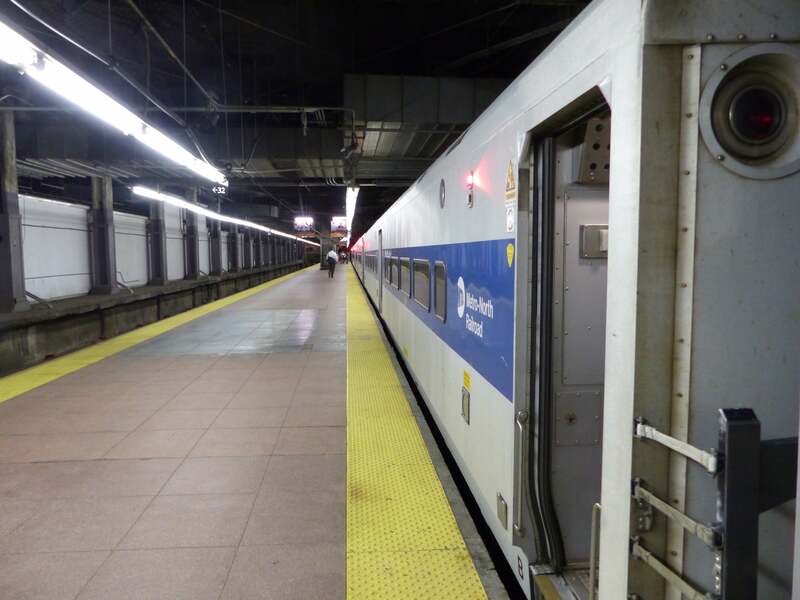 When you exit the train, you can head toward a staircase that goes over the tracks and down to street level or toward the opposite end where you’ll find stairs going down and an elevator. In the parking lot, you’ll find buses and cabbies — the taxis require medallions and a “taxi” sign on top of the roof. The 20-minute drive from here to SWF is about $35. Stewart International has been around since 1939. It’s small by modern standards (2,400 acres) and has just two runways. A few other airlines operate here as well, including American Airlines, United, Delta, JetBlue and Allegiant Air. The complex houses a couple of shops: a duty-free store, a Quiznos and two magazine-and-snack shops (one upstairs and one downstairs). Norwegian’s ads appear all over the place inside and out. On the day of this inaugural flight, I caught part of the launch party and press event — representatives from Stewart Airport, Norwegian, I Love NY and Orange County spoke to a small crowd. 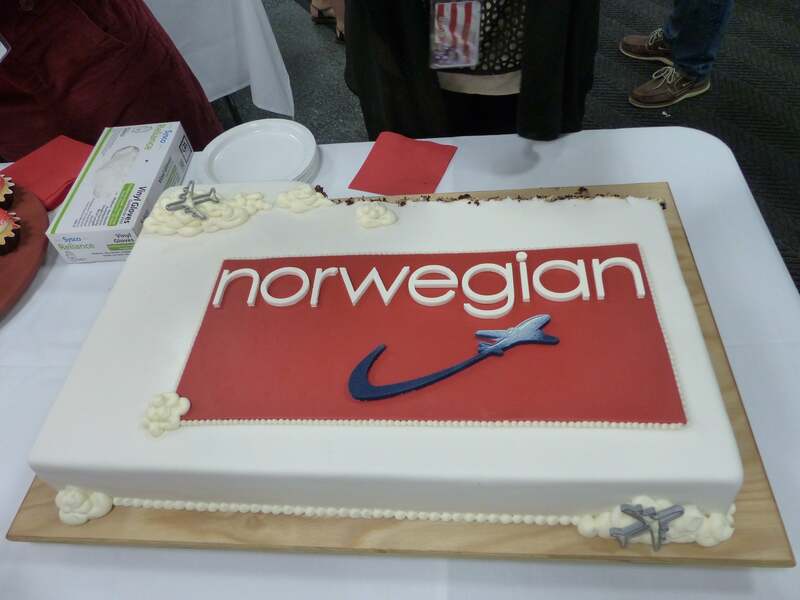 The mood was festive; there were free Norwegian cupcakes, sunglasses and cake for anyone who wanted it. Unlike many airports these days, this one does not have kiosks (yet). 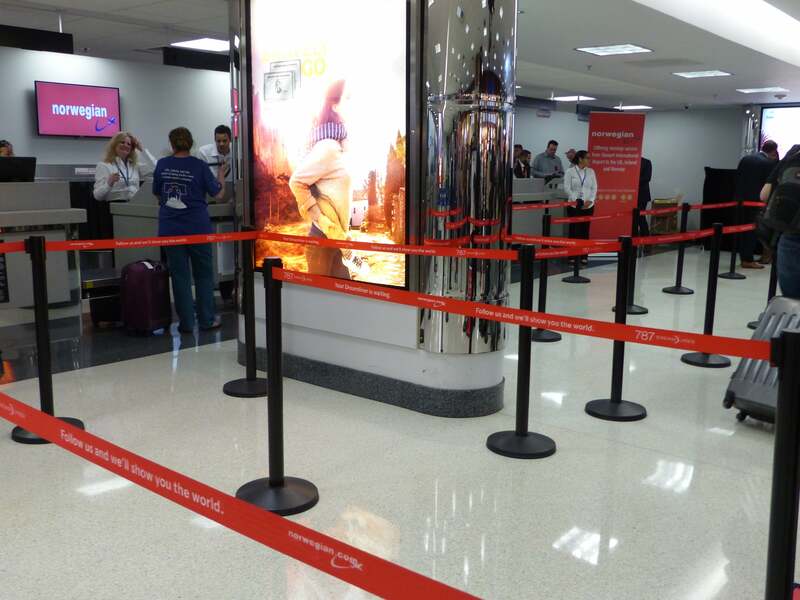 The line to check in, cordoned off in signature red rope, was empty when we arrived more than two hours ahead of the flight. The TSA line was equally empty and brief. Upstairs, there are a total of seven gates, a few device-charging stations and one set of bathrooms. At no time was there ever more than two people ahead of us. This was the least stressful airport I have ever been to. While we didn’t have the MAX, our 737-800, EI-FJS, was less than one year old. It offered 186 standard seats arranged in a 3-3 configuration. Each one is 17.2 inches wide and has a pitch of 29-31 inches — if you’re looking for more legroom, opt for the bulkhead seats in row 1. The overhead bins are roomy and accommodated my large carry-on straight on — I did not have to place it sideways. The plane had arrived from Edinburgh but was sufficiently cleaned up enough to seem newish. 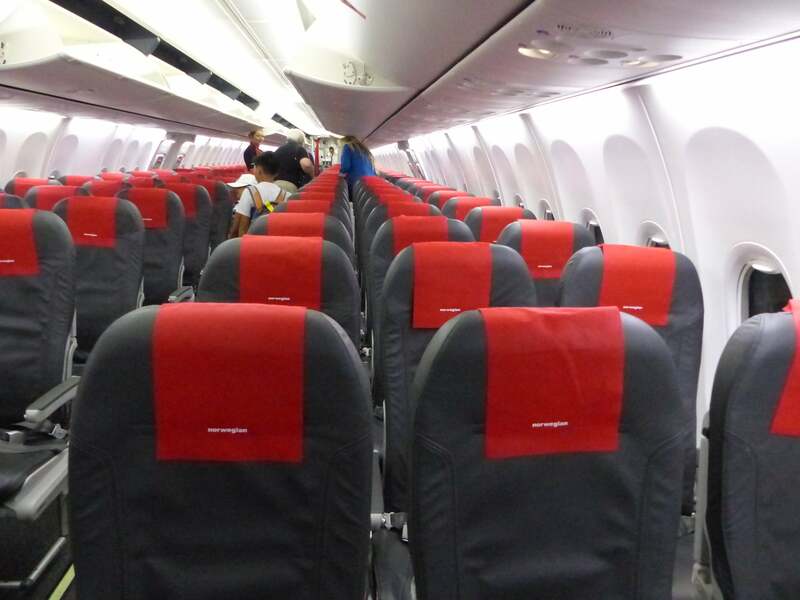 Some safety cards were bent, and menus popped up in some seat-backs and not others, but it still looked like an immaculate sea of red as I entered the cabin. The seats were narrow, though, and didn’t recline very much. Two middle-aged women behind me grumbled that “this doesn’t look like it’s going to be comfortable for eight hours.” It turns out the flight was only 6.5 hours long, but it was pretty tight. When the tray was down, I could not comfortably fit my laptop and ended up just working on my lap instead. 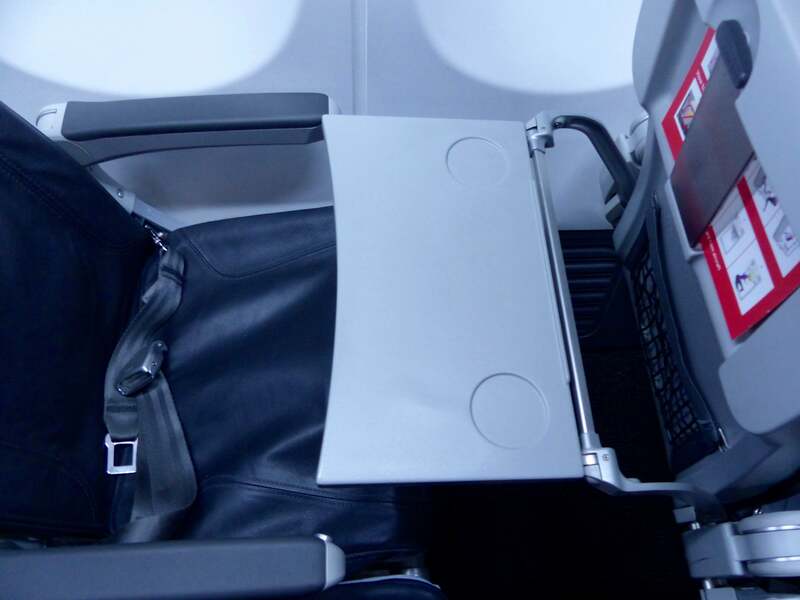 There was no in-flight entertainment screen and in its place was a bin big enough to hold a few magazines. A mesh pouch below the bin was not as elastic as I would have liked; my camera didn’t even fit inside. Annoyingly, the free Wi-Fi was too weak to even view websites, although it did recognize some files stored on Google Drive. A Norwegian Airlines magazine dated June 2017 suggested that once I connected to “Norwegian Internet Access” I would be able to browse the internet and even watch live TV. Alas, I read magazines and snoozed instead. 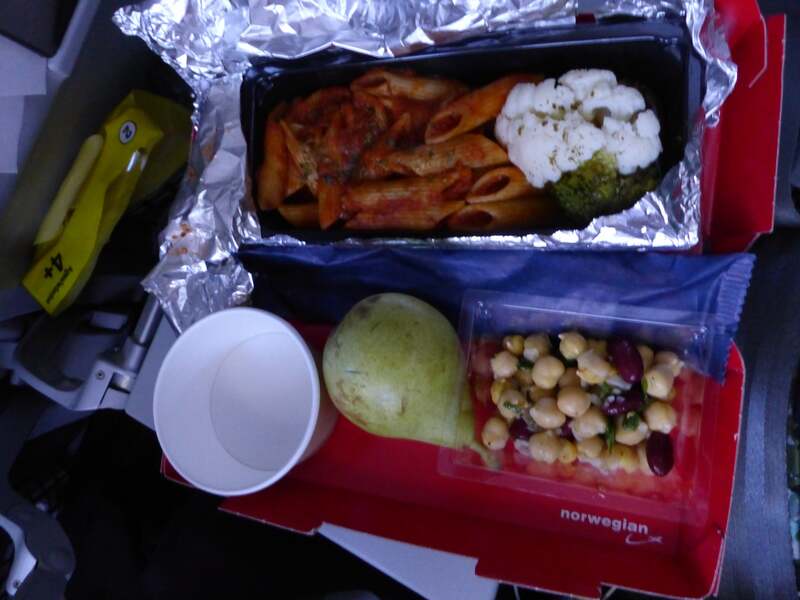 The prepaid meal was served in red plastic trays that evoked fast food containers, while tinfoil made the dishes seem even less glamorous. There were two options: beef or chicken. I chose the latter, which came with rice, a few slices of zucchini, a small cucumber salad and a blondie brownie. The chicken was the tastiest since it was covered in spices. The blondie brownie was chewy in a good way and not too sweet. The rest was bland, bland, bland. The vegetarian meal turned out to be pasta in red sauce with cauliflower, garbanzo beans and a pear. There was no bread or biscuits. 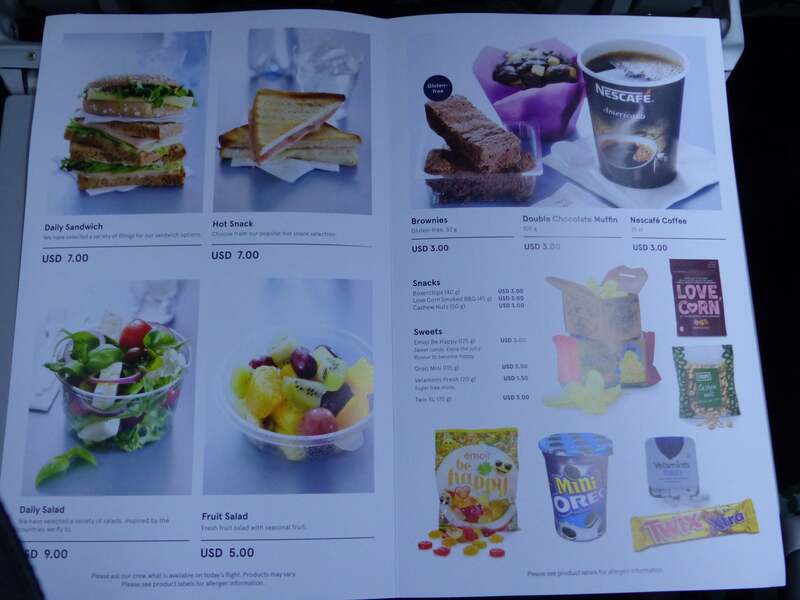 The Summer/Autumn 2017 menu — with snacks for sale throughout the trip — listed a salad, a sandwich, a fruit salad, potato chips, cashews and the usual selection of drinks, including water, coffee and colas for $3 a pop, as well as beer, wine and spirits. Was there a Scotch whisky? Yes, a glass of Glenlivet Master Distiller’s Reserve, available for $8. The young staff served food and drinks with smiles. I spontaneously flagged down a flight attendant walking down the aisle and asked for a water at 2:15am just to see how long it would take to quench my thirst. He immediately turned around and brought a glass to me. When we arrived in Edinburgh, we disembarked via a staircase instead of a jetway and passengers rode in two (crowded) buses to get to the baggage claim area. Is it worth the trek? Will people travel 60 miles north to save several hundred dollars on airfare? I think they will and here’s why: Getting to and from JFK and LaGuardia is never fun — there are always crowds and people do not seem happy. If you’re willing to take a train and a cab (or bus) to the airport, to lose another hour or two and to fly in a not-especially luxurious cabin, then the whole SWF experience feels like a conscious decision to prioritize budget — and peace of mind — over time savings. I may actually do it again. 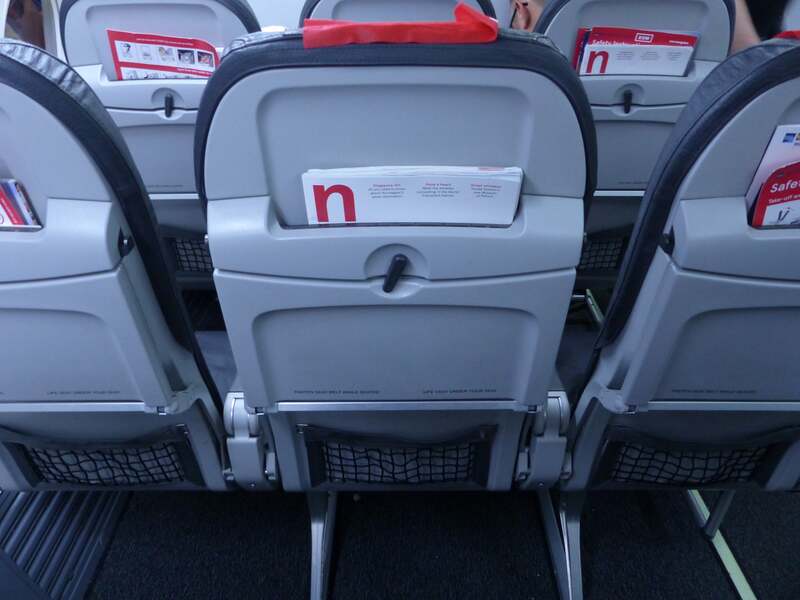 Have you had a chance to fly on Norwegian’s 737-800? Tell us about it, below.